Confession: I’m a new convert to the world of red velvet. In the past, I haven’t really gotten the hype over it, which is due in large part to my misunderstanding of what red velvet cake really is. In my ignorance, I always thought it was…well, a red cake. Big whoop. I mean, couldn’t you pour in a bunch of any food coloring and have a new phenomenon – yellow velvet, blue velvet? I know. I’m so close-minded and judgmental. But really, I didn’t get it. Then, at a restaurant a few months ago, on a whim my husband had the red velvet cake for dessert. And I ate most of it. I was smitten. Big time. It’s not just a red cake. It is an extremely light, moist cake with the barest hint, and I mean barest hint, of cocoa. Paired with luxurious cream cheese frosting, it is undeniably delicious. 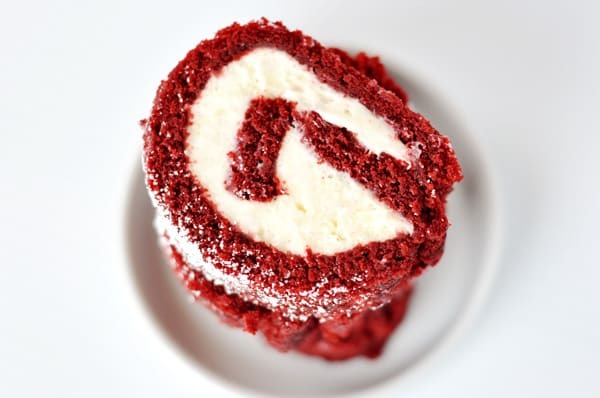 Since devouring my husband’s dessert, I’ve since made red velvet cupcakes, a red velvet cake and most notably, this red velvet cake roll, which basically puts the cupcakes and cake to major shame. 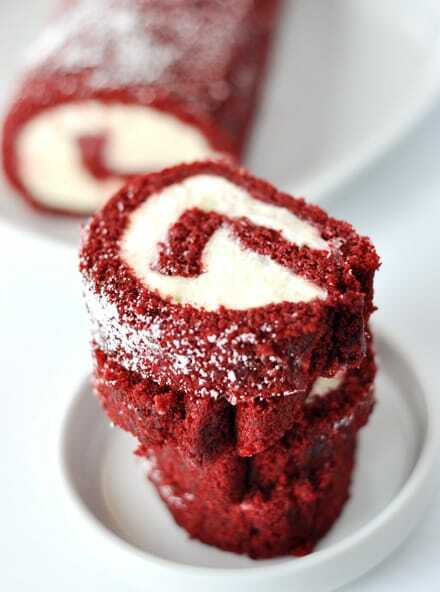 I’ve now realized, it isn’t just red velvet that I love – it is the Red Velvet Cake Roll. I even went out on a limb and made a green version for St. Patty’s day this year (you know, channeling my inner food scientist and calculating the difficult measurements of swapping out red food coloring for green). Tender, moist cake wrapped around a decadent, rich cream cheese and white chocolate filling – not only is it stunning in presentation, it is utterly irresistible to the taste buds. For the cake: Center a rack in the oven and preheat the oven to 375°F. Coat a small area in the center of a 15 1/2 X 10 1/2-inch pan (jelly-roll pan) with nonstick spray. Line the pan with aluminum foil, pressing the foil into the contours of the pan and leaving a 2-inch overhang at each short end (the spray anchors the foil in place to make buttering easier). Butter the foil, then flour it, tapping out the excess flour (I have also used the Baker’s Joy spray with oil and flour together with great results). Sift together the flour, cocoa, baking soda, and salt onto a sheet of waxed paper; set aside. In a small bowl, stir together the milk, vanilla, and apple cider. In a large bowl with an electric mixer (handheld or stand mixer), beat the butter on medium-low speed until creamy and smooth, about 1 minute. Increase the speed to medium and add the granulated sugar in a steady stream. Continue to beat until light in color and fluffy in texture, about 2 minutes, stopping the mixer occasionally to scrape down the sides of the bowl. With the mixer on medium speed, add the egg and mix until combined. On the lowest speed, add 1/3 of the flour mixture followed by 1/2 of the milk mixture, mixing until combined after each addition. Again, add another 1/3 of the flour mixture, the last half of the milk and the last 1/3 of the flour, mixing after each addition. Scrape down the sides of the bowl as needed. Maintaining the same speed, add the food coloring (be careful of splatters!) and mix well to color the batter evenly. Without delay, spoon the batter into the prepared pan, spreading evenly with a rubber spatula. Bake the cake until it is set on top and springs back when lightly pressed in the center, about 10 minutes. Transfer the pan to a wire rack. If necessary, run a thin knife blade around the perimeter of the pan to loosen the cake sides. Then pull up on the foil overhang and carefully transfer the cake to a wire rack. Without delay, place a sheet of foil over the cake and manipulate the foil to make a shallow tent (a tent holds in the moisture as the cake cools, but prevents the foil from sticking to the cake). Let the cake cool for about 45 minutes, then proceed to assemble the dessert. To make the white chocolate–cream cheese filling: in a medium bowl (with a handheld or stand mixer), beat the cream cheese on medium-low speed until smooth. Pour in half of the melted chocolate and beat until smooth, stopping the mixer occasionally and scraping the down the sides of the bowl. Pour in the remaining chocolate and beat just until combined. Add the butter and then the sugar and beat until smooth and creamy. To assemble the cake (see pictures below): Remove the foil from the top of the cake. Transfer the cake on its bottom sheet of foil to a work surface, placing it so that one of its long sides is parallel to the edge of the surface closest to you. Place another long sheet of aluminum foil on the work surface nearby. Using an offset spatula, spread the filling evenly over the cake, leaving a 1/2-inch border on the long side farthest from you. Begin rolling the cake by flipping the edge nearest you over onto itself. Then, with the aid of the foil that extends beyond the short sides, roll up the cake lengthwise until you reach the far long side. As you work, wrap the foil around the roll to assist in rounding the shape (otherwise the cake will stick to your hands). To insure the roll is uniform and round, place the rolled up cake in its foil across the bottom third of a 24-inch-long piece of parchment paper, bringing the top edge of the parchment paper toward you, and drape it over the top of the cake roll, allowing a 2-inch overhang. Place the edge of a rimless baking sheet or cooling rack or other long edge at a 45-degree angle to the roll and your work surface. Apply pressure against the roll, trapping the 2-inch overhang, and push while simultaneously pulling the bottom portion of paper toward you. This push-pull motion creates a resistance that results in compressing the log into a uniform shape. If any cracks appeared as you rolled the cake, they are consolidated in this compression and disappear from view. Carefully lift the roll in the aluminum foil and set it, seam side down, on a fresh sheet of foil. Wrap the cake securely in the foil. Transfer the foil-wrapped roll to the baking sheet or shallow tray and refrigerate for about 30 minutes to help set the filling. To serve: remove the cake from the refrigerator and peel off and discard the foil. Carefully lift the roll onto a serving plate with the aid of a long, wide spatula or a rimless baking sheet. (If not serving right away, cover loosely with plastic wrap to keep the cake’s surface from drying out and return to the refrigerator to serve the same day.) Dust the cake with powdered sugar. Using a serrated knife and a sawing motion, cut the roll into 1/2-inch-thick slices. Don’t be alarmed by the lengthy recipe. This cake is really not difficult to prepare and assemble but the long instructions really help give detail to rolling the cake tightly to avoid cracks. I’ve provided a picture tutorial at the end of the recipe for details on rolling and compressing the cake roll. I love this cake! I made it twice and both times delicious, but both times it looked like a hot mess lol. I have made toll cakes many times but cannot for what ever reason get thia one to look good. However that will not stop me from trying again. How early ahead can you make this for it to stay good? Just a thought — what if you rolled it from both ends toward the center to create a heart shape? I don’t think I’m describing it very well … but I’m tempted to experiment! It looks delish! I am trying to find the perfect recipe that isn’t too dry and doesn’t crack. I have to make about 35 rolls and am wondering if this freezes well. Also, I have never used aluminum foil for rolling. It doesn’t stick? Yes, this should freeze just fine! You can use a tea towel for rolling if you are worried about sticking issues. The instructions mention serving the cake roll the day it’s prepared. Have you tried making it the day before and keeping it refrigerated? I’ve made it the night before and it’s fine but I haven’t tried it any longer than that. Very good recipe! First time I’ve made a cake roll dessert and I was so happy with how it turned out. I made it for my mother-in-laws dinner on Mother’s Day. I had a little trouble figuring out the “compression” step, but my smart husband figured it out and compressed so much it started squeezing out the sides. Ha! Still turned out beautifully once the ends were trimmed and there were no cracks. Highly recommend. Angela, it’s been awhile since I made this but I remember it being like a slightly thick cake batter. Is the batter supposed to be thick? Mine looks like a thin cookie dough. Does that make sense? I want to make this for our Christmas dessert at my aunt’s house but will have to make it the morning of the 24th due to timing issues – will it last 24 hours in the fridge and still be delicious? Rachelfite – yes, I think it would be fine for 24 hours. Hey Mel, I’m really excited to try this but I had one question. I make pumpkin rolls all the time and use the towel method to roll, which I noticed you do on yours as well. How come you don’t do the same on the red velvet? Tracie – mostly because the red velvet original recipe used the tin foil method (and pressing it with a straight edge) to prevent cracking. I made it that way first and have never transitioned over to the towel method. 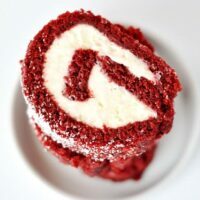 The red velvet cake portion of this recipe is a bit more tender and crackable then the pumpkin cake in the pumpkin roll recipe and so I think this red velvet cake roll benefits from the tight rolling process. Awesome, awesome recipe! Followed it to a T… it is spot on and tastes as amazing as it looks! Thanks for the recipe! amazing flavors!and very easy to bake, but had a little trouble with the rolling.I wish there was a way you could make a video off the rolling, it would make it so much easier because I will be making it alot more! This looks AMAZING! I am going to try to make this for my Bible study tonight. Thank you so much!!! Just finished making this for a work picnic dessert competition…wish me luck! P.S. Thanks for the directions. It was fairly easy and very delicious! Hi was wondering what i can sub for greek yogurt cuz i dont have any. Nan – I’m not familiar with the white velvet icing. If it is sturdy enough to not slide out of the roll it should work just fine. Good luck! My husband loves, loves, loves red velvet cakes and gets one every year for his birthday (for the past 50 years!!) since we’ve been married. I use the White Velvet icing, would this work in the roll? Can wait to try your recipe. I tried this recipe for my friend’s birthday, and it was a big hit! It wasn’t hard to make either, except for the rolling… I had a bit of trouble with cracks, however most of them were hidden in the middle of the roll.. Maybe it should be baked for just a bit longer than 10 minutes to prevent the cracks? Either way it is a great recipe! Hi, do you have or know of a red velvet cake recipe with this cream cheese filling? I’ve been searching for a similar recipe, but to make a cake for a birthday. Perhaps you have these ingredients in a standard layered cake on your site?!? Susannah – I don’t have a red velvet cake recipe on my blog, other than this one. Good luck in your search! For the cake roll process do you suggest using the tea towel method that you used for the Pumpkin Roll or do you like this foil method better? JenH – you know, both methods will probably work. 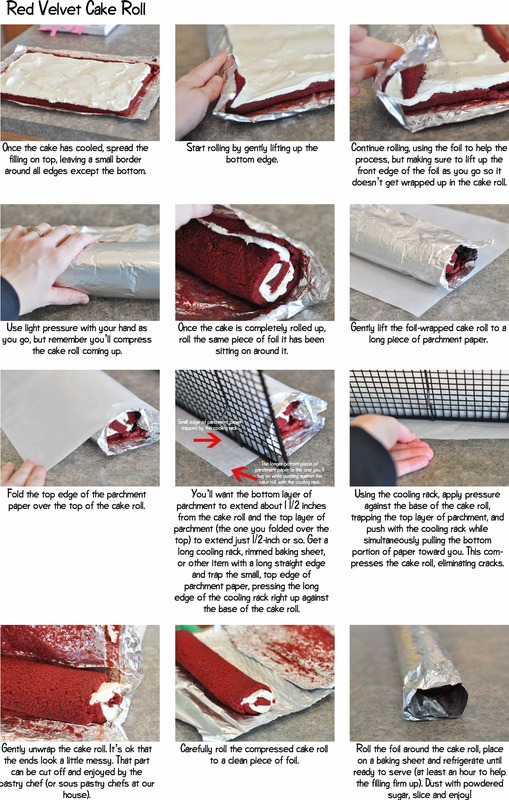 I have only ever used the foil method with this red velvet roll and like it mostly because the cake is so moist and well, red, that it doesn’t end up staining a towel. Either would would be fine, I’m sure, just make sure on this cake roll to roll as tightly as possible to minimize cracks. I always trust your recipes and I’ve been looking for a trustworthy & delicious red velvet cake recipe FOREVER! I make wedding cakes but none of the red velvet recipes I’ve tried really work out. I was so excited to see you have one you’re in love with but when I tried it, mine tasted like play-doh. I tried several batches…is there a trick to it? any tips on what I might be doing wrong? Katie – I’m sorry you didn’t have great luck with this. I have no earthly idea why you are getting the play-doh flavor. I haven’t had the same results at all and don’t know why that would be happening. Maybe secretly my palate likes play-doh so I don’t notice?? I really hope that isn’t the case. Sorry it didn’t work out for you! You have GOT TO STOP posting SUCH delicious and easy recipes. I’ve been eying this one since you put it up, but have finally given in to the deliciousness. My rolling was messy, and it cracked in the middle, but it’s still AMAZING. My birthday is next week, and I told DH he better read up, because I want him to make another just for me! Incidentally I recently made a layered sheet red velvet cake for a friend and wanted to roll the rest of the batter. The towel on hot cake failed on me as well. I wish you’d have posted this earlier but the next time I’ll try your rolling method with the current recipe I’m using. I am so glad you have been converted to the red side!!! I just made red velvet cupcakes and I loved them, but if you say this cake roll puts the cupcakes and cakes to shame, I guess I better test it out! I saw a red velvet cake roll in a Paula Deen magazine awhile ago and have been dying to try it out. Thanks for the step-by-step photos. It’s actually supposed to be a chemical reaction between ingredients (I think the baking powder or cocoa) and ZERO food coloring. I’ve yet to buy the old version of the ingredient that makes it a true red velvet cake. Have you tried it that way? It’s so good and just barely red. Yum!!!! Sallyhp – no, I’ve never made it that way. Sounds interesting, though! i’ve always been a wee bit put off by the amount of food coloring that goes into a red velvet cake and it has the potential to ruin many clothes and/or kitchen paraphernalia, but it is tasty. i like the roll. Mariss – GREAT idea. I think it sounds elegant and absolutely delicious! Hi Gina and Jaime – no, this recipe wouldn’t interchange well with cupcakes since it doesn’t make a “full” cake and instead is tailored for a flat cake roll. Will the cake recipe work to make cupcakes or will it be too soft? Although I have had Red Velvet cake I never wanted to make it because putting an entire bottle of red food coloring just sounded- awful- though the pre-made ones I would break down and eat. You also have convinced me to make the attempt to bake one myself – other than that one in a Duncan Heinz box I made. Your version doesnt seem to have the amount of red food coloring that other recipes I have seen ask for. Too much red coloring leaves a distinct distracting taste. I do have a question about the foil. Would parchment paper work as well or better? I would think it would roll and not be quite so cumbersome. Just a thought. I really enjoy your blog and I agree with another poster, you have great step by step pictures. Mariss – I suppose parchment would work just as well. I didn’t really notice the foil being a problem to work with – I think you could use whatever you are most comfortable with. Let me know if you try this and what you think of the almighty red velvet. This looks so delicious, Mel! Decadent as ever, too, which is just my style of dessert. I love red velvet cake and I love this recipe. Thanks for sharing! OK , I too dont get the whole red velvet cake craze. It seems like the same thing as the whole green or blue ketchup Heinz marketed a couple of years ago, same taste lots and lots of extra chemical (ie food coloring). I get that red velvet cake is different from a traditional yellow cake, but wouldn’t the cake taste the same without the Tablespoon of red food coloring? Karrie – the red food coloring doesn’t necessarily add to the flavor (in fact too much coloring and it can detract from the taste) so without it, the cake may taste the same but would look pretty ugly, I think, based on the small amount of cocoa. Oh… thanks for letting me know that. I’m glad I checked back before I make this. I defnitely don’t want it to fall apart on me, so I’ll use the foil method. I love the colour of the sponge. Looks really tempting. How I wish I can have one right now! Hope you’re having a great day. I love anything red velvet. This cake roll is gorgeous and looks amazing! Please oh Please make this for me and ship it out! I turn 50 in December and am craving a Red Velvet Cake…no-one here understands my obsession with them…they think buying one from the local market will be just fine – ACK! Totally don’t get the red velvet obsession, but since this recipe is tried and recommended by you (and since it has cream cheese in it) I’m going to give this one a try! My daughter is a huge fan of red velvet. She turns 16 in a few weeks. I have bookmarked a red velvet cake from I Am Baker to make, but I think a platter of these next to the cake will be perfect for the “too busy to stop and eat” teenagers. I’m so glad you’re a red velvet convert! And you got the ratio of cocoa powder just right–most people make a chocolate cake with too much cocoa powder. Your’s is perfect! I LOVE red velvet cake! I am so happy to hear that you finally tried it and understand the red velvet love! Wink. Wink. This cake roll version is so pretty! My grandma always made the grandkids a Red Velvet Cake for birthdays… I’m looking forward to trying this new variation. Looks delicious – as always! I am a total red velvet fan. I did a red velvet week for Valentines day on my blog this year, and it was so much fun I’m going to do it again next year – so I’m bookmarking this recipe!! That looks delicious! I’m going to have to try that myself. Mel… it’s much easier to roll a cake using a cotton tea towel. Lay the towel out on the counter and sprinkle it with powdered sugar. When the cake comes out of the oven, turn it onto the towel and immediately roll it up with the towel inside the rolls. Let it cool completely, then gently unroll and add your filling. Wow, your cake roll looks delicious! It’s been several years since I’ve made any type of cake roll. Seeing this makes me want to make one again. This looks really elegant! It’s a bit hard to read some of the instructions in white on the eighth thumbnail, but I think I get the gist of it. Lisa – you can click on the step-by-step pictures to enlarge the image so you can see the words close up, if need be. Karen – I like to use that method when I make pumpkin rolls. I tried it with this recipe, originally, and the cake is so delicate, it basically fell to pieces in the towel while it was still warm, which is why I ended up trusting Flo Braker’s instructions and rolling it up the way I pictured at the end. It makes it a little more complicated but the towel trick didn’t work for me this time.